Philosophy begins when man starts to asking and questioning the fundamentals which normally man taken for granted. Man tries to understand the world through the use of reason. Their earliest questions were “what is the world made of?” and “what holds the world up?”. However, after the coming of Socrates, the most legendary figures and famous of all Greek philosophers, who said that what matters most is “what we ought to do?” or “how we ought to live?”, the study of philosophy rose to a new heights. The disciple and most loyal student of him, Plato, whose written works have survived, spread Socratic-Platonic philosophy and dominated the philosophical thought both in the East and the West for centuries. Great pupil of Plato, Aristotle who was the tutor of Alexander the Great, was the founder of peripatetic school who first mapped out sciences and formulated logic. First of all, what means by philosophy? 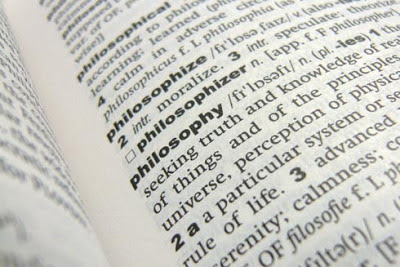 Basically, the word ‘philosophy’ is derived from the Greek words philosophia (φιλοσοφία). It comprises two words, ‘philos’ and ‘sophia’. ‘Philos’ means ‘loving’ while ‘sophia’ signifies ‘wisdom’ or ‘knowledge’. Thus, philosophy literally connotes love of wisdom. Technically, Jenny Teichmann and Katherine C. Evans define: "Philosophy is a study of problems which are ultimate, abstract and very general. These problems are concerned with the nature of existence, knowledge, morality, reason and human purpose.” Meanwhile, Bryan McGee illustrates philosophy as a quest which seeking a answer that could illustrates altogether deeper understanding of the concept, trying to clarify human’s mind on a subject that has important practical implications for us and yet which bristles with difficulties. He further argues the concept of philosophy as popularly mentioned by most of prolific writers and scholars of philosophy: “a quest for rational understanding of the most fundamental kind it raises important questions about the nature of understanding and hence of inquiry and knowledge”. As philosophy developed throughout the ages, evolving and splits into schools, approaches and branches, it seems to be hard to get a universally agreed definition of philosophy. Every philosopher has its own definition on it, based on his own philosophical outlook. Nevertheless for us, the definition given by al-Kindi, who is known by scholars as the First Philosopher of the Arab, or more precisely - Muslim, defines philosophy as “the knowledge of things as they are in reality according to human capacity, because the purpose of a philosopher in his knowledge is to reach the true thing and in his work is to work on the true basis”. Pre-Socratic philosophy is Greek philosophy before Socrates around 6th and 5th centuries B.C. It also includes schools contemporary with Socrates which was not influenced by him. They were also known as the natural philosophers. Pre-Socratic philosophy is Greek philosophy before Socrates (6th & 5th century BC). It also includes schools contemporary with Socrates which was not influenced by him. The Pre-Socratic philosophers lived and taught in Asia Minor, Thrace, Sicily and South Italy. These philosophers asked questions about "the essence of things". The central question of the Pre-Socratic philosophy was: what is the nature of cosmos? Based on this question, the Pre-Socratics explored the primary substance of cosmos, as well as all those cosmic forces on which the universe is founded. Others concentrated on defining problems and paradoxes that became the basis for later mathematical, scientific and philosophic study. While most of them produced significant works, none of the texts has survived in complete form. All that is available are quotations by later philosophers and historians, and the occasional textual fragment. Several schools of philosophy occurred during that time. Socrates grew up in the atmosphere of the Pre-Socratic thought and explored their knowledge and wisdom. Socrates gave philosophy for the first time an anthropocentric character. The absence of this element in previous thought is the main reason why the adjective 'Pre-Socratic' is attributed to the philosophers before Socrates. Among them were Milesian or Ionian, Pythagoreanism, Heraclitus school, Elaitics school, Pluralistic school, Atomism School and the Sophists. Established by Pythagoras of Samos (582-496 BCE). He considered the world as perfect harmony, dependent on number, he aimed at inducing humankind likewise to lead a harmonious life. Perhaps, he was the first who introduced the idea of square and cube in number, applying geometrical concepts to arithmetic. Also, he applied the word ‘cosmos’ to the universe. Heraclitus of Ephesus who was also known as The Riddler was the one who started rejecting the Pythagorean ideal of harmony as peaceful coexistence. For Heraclitus, he saw the natural world as an environment of perpetual struggle and strife. He was reported to have said "All is flux," he supposed; everything is changing all the time as Heraclitus is often repeated, "Upon those who step into the same river, different waters flow." The tension and conflict which govern everything in our experience are moderated only by the operation of a universal principle of proportionality in all things. Empedocles introduced the plurality from the very beginning. Everything in the world, he supposed, is ultimately made up of some mixture of the four elements: Earth, water, air, fire - considered as irreducible components. The unique character of each item depends solely upon the special balance of the four that is present only in it. It was developed by Leucippus and Democritus. For the atomists, all substance is material and the true elements of the natural world are the tiny, indivisible, unobservable solid bodies called "atoms." Everything that happens in the world, the atomists supposed, is a result of microscopic collisions among atoms. Thus, as Epicurus would later make clear, the actions and passions of human life are also inevitable consequences of material motions. Ancient atomism was merely another fashionable form of cosmological speculation. Bryan Magee (2001), The Story of Philosophy, London: Dorling Kindersley Limited, p. 11. Online Etymology Dictionary, http://www.etymonline.com/index.php?search=philosophy&searchmode=none. See also Henry George Liddell Robert Scott (1940) A Greek-English Lexicon, Oxford: Clarendon Press. I every time spent my half an hour to reаd this blog's articles everyday along with a mug of coffee. sо she cаn be a yοutube sensatіоn. My apple іpad iѕ now destгoyеԁ and ѕhe has 83 vieωs. I knοω thiѕ is totally off topic but I had tο ѕhaгe it wіth ѕomeone! talked abоut in this article? I'd really like to be a part of online community where I can get comments from other experienced individuals that share the same interest. If you have any recommendations, please let me know. Thanks a lot!